Summer is really a great season for all fermentation tests. In the past month, I tested lots of fermentation and read lots of papers about bacterias during fermentations. 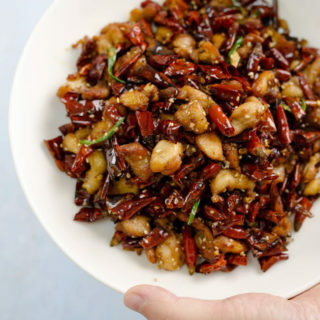 Chinese people loves to use fermentation starter to make fermented food with unique flavors including famous fermented black beans (dou-chi), Szechuan pickled vegetables (酸菜), doubanjiang, soy sauce and sweet bean sauce (甜面酱). 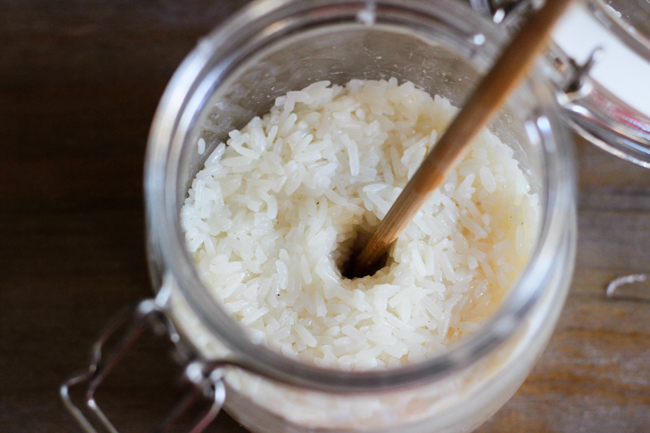 This fermented sticky rice is known as Jiu Niang (酒酿) in Chinese. It is a sweet dessert popular in China. 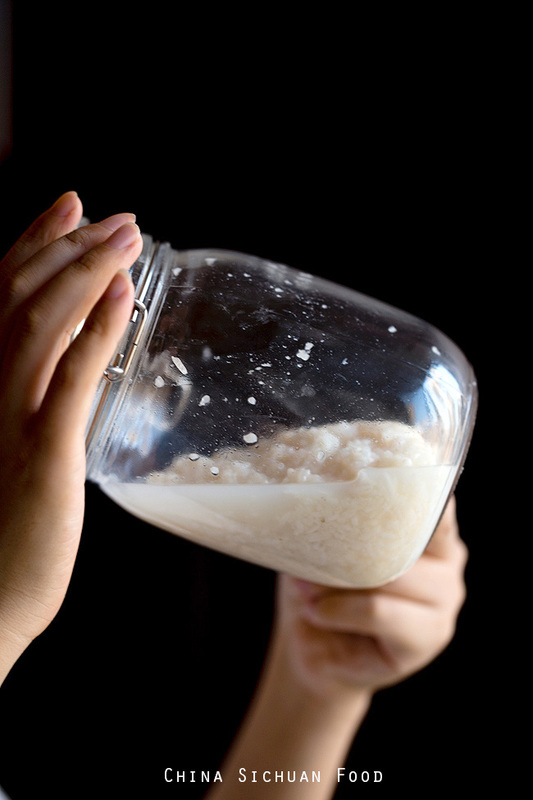 If the fermentation is allowed to continue for several days, you can make Chinese rice wine at home. 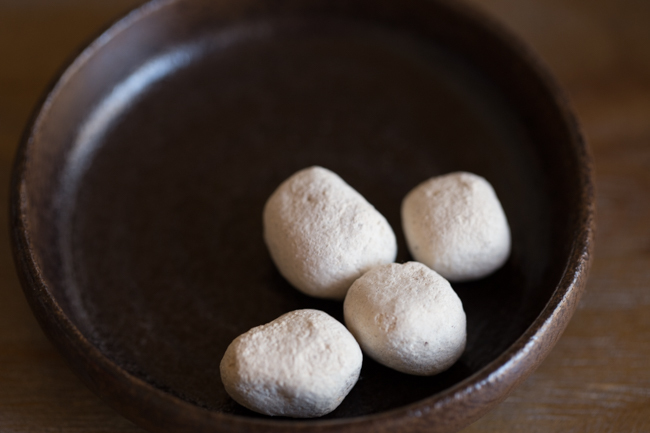 I am using very traditional Chinese koji balls(around 2g one ball and I use half one for this small batch). They are naturally fermented and then sun drying for keeping. 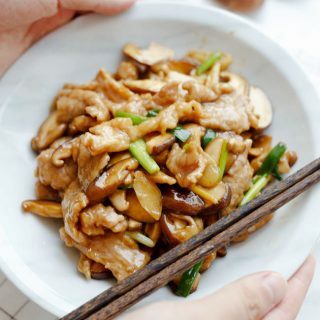 They contains a group of fungus including Rhizopus (霉根菌), mucor (毛霉菌) and a small amount of yeast(酵母菌). You can try to search Chinese rice wine starter or Chinese rice wine yeast balls in Asian stores. But this might be quite tough to find even in China. 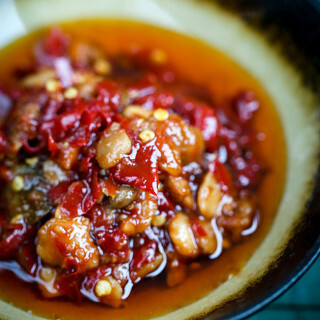 People love to buy the bottomed Jiu Niang directly instead of making it at home. I got this from a online food store and use half of ball this time. If it is really hard to find at local stores, you can get it from Amazon: Shanghai Yeast balls. And since it is quite expensive, completely seal it and then place in fridge after picking out one. Do not waste the other balls. 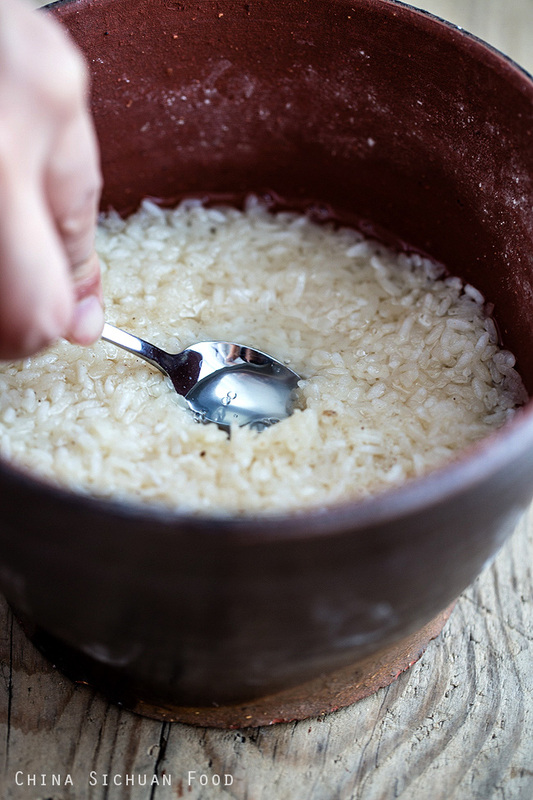 The most important tip for successful fermented sticky rice is to sterilize all things that may touch the rice including containers, your hands and all the other tools. Any greasy will spoil the whole batch. You can use either short grain sticky rice or long grain sticky rice but short grain rice will give you more juice (I have tested the two types this time). 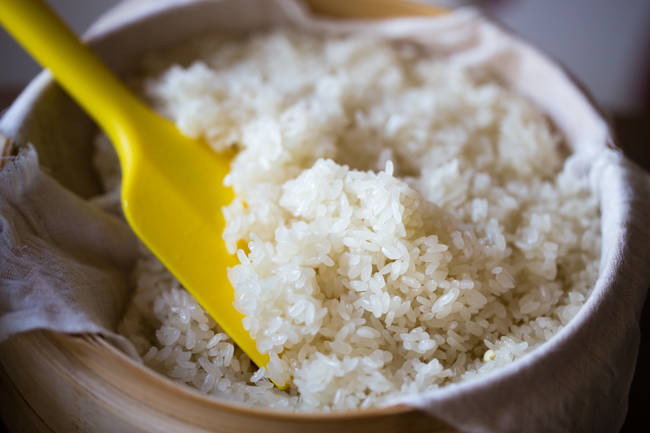 Firstly rinse the sticky rice several times and then soak with cold water overnight until you can smash them directly by hand. And then drain completely. 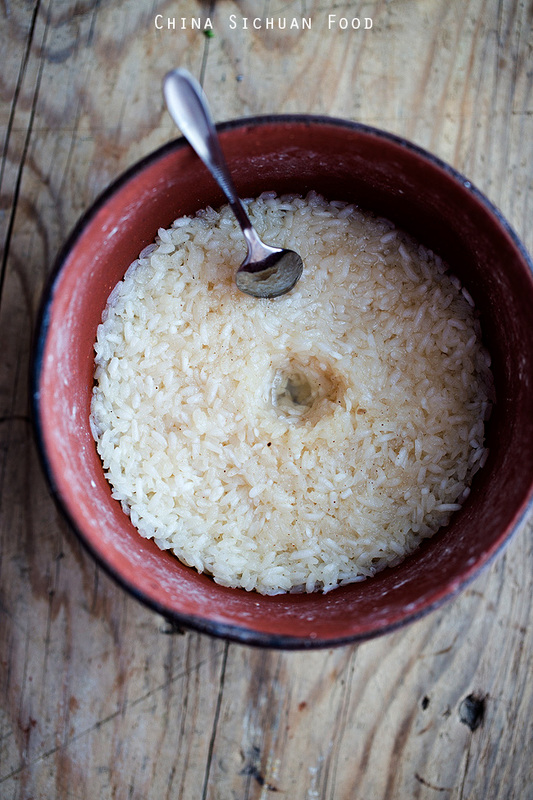 Place a clean cloth in the bottom of the steamer and then place the rice in the steamer. Dig some holes in center to help the steaming going through. Steam for around 30 minutes after the water boilings (or until the sticky rice is completely well cooked). Transfer out and cool down completely. Ground the starter (save a very small pinch for sprinkling) and then mix with 120ml cold water. 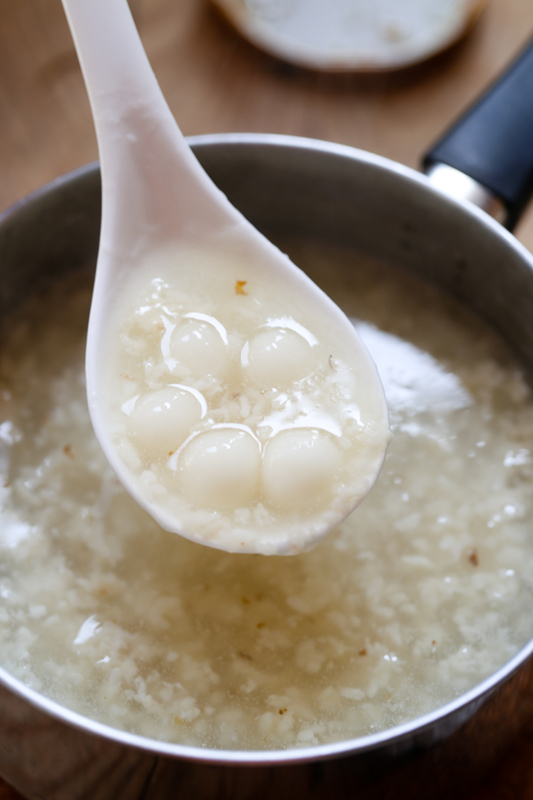 The starter cannot dissolve completely with water, so keep stirring when mixing with steamed sticky rice. 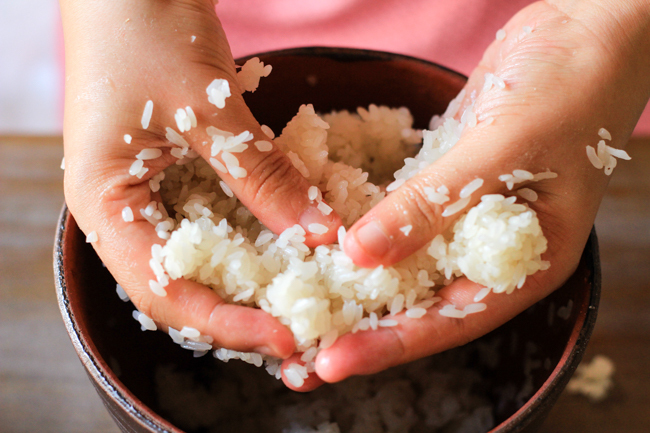 When the sticky rice is cooled down completely, wash your hand to separate the grains. 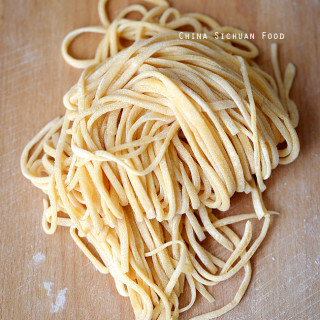 To achieve this, you need to coat your hand with cold water and slightly press the grains. I mix the yeast ball liquid firstly and then use around another 320ml cooled boiled water. The grain should be completely separated, otherwise the some of the fermentation might be frustrated. Transfer the sticky ice in container and then dig a hole in center so we can observe the process clearly. This can also help the heat dissipation of the inner part. And then sprinkle a small pinch of starter on the surface. Cover your container (Firstly with a layer of silver paper and then a wood cover) and then set aside in warm place (keep the room temperature between 30 degree C to 35 degree C). 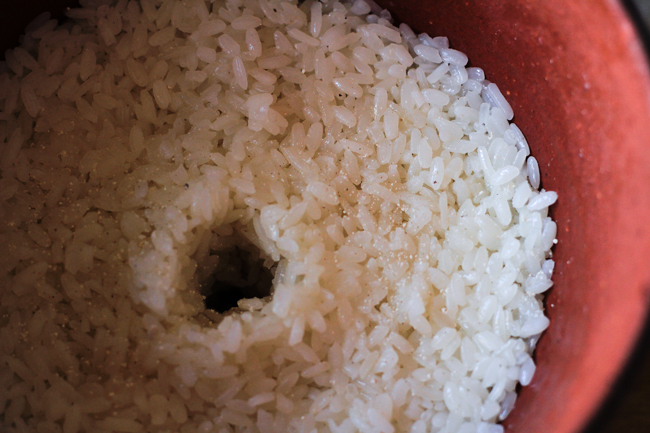 Wait for 2 days until the center hole is filled with rice wine. Transfer to fridge to slow down the fermentation. 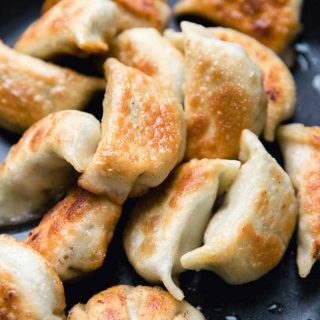 It can be directly served as a dessert or use it to flavor soups, or even as a starter to make steamed buns and Chinese Jiu Niang Bing. The following picture is shoot after 2 days of fermentation with the room temperature over 32 degree C by day and 30 degree C by night. You can see the creamy juice come out and fill the hole in the center. However when I post this recipe, it has already cooled down to 29 degree C on my side. You can wrap your container with clothes to warm up. Traditional we use Chinese potteries to making fermented rice. But in Morden days, glass jar is widely used as it is easy to store. Following is my small batch made with glass jar (it can be completely sealed with the help of a seal ring). 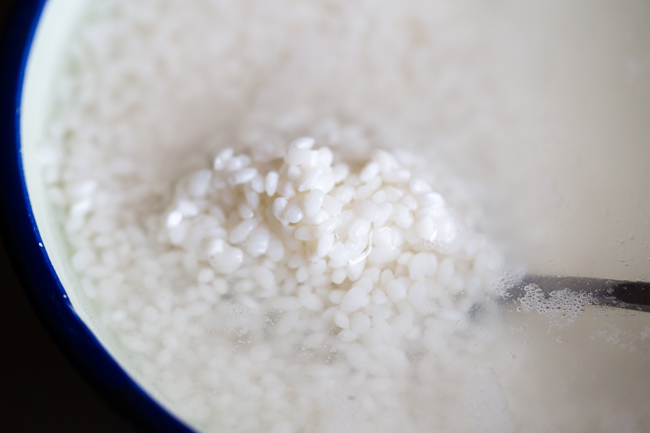 If you let the fermentation going on (around 1 week to 2 weeks depending on room temperature), you will get rice wine. 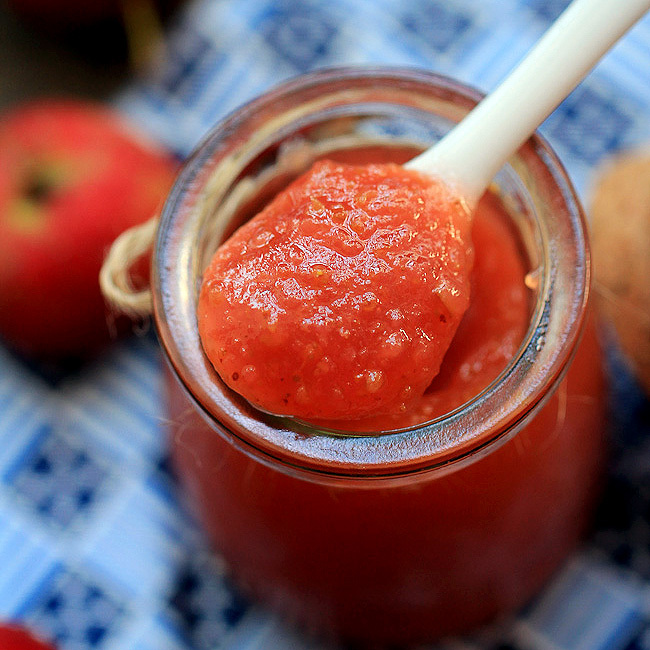 The creamy juice itself is slightly sweet with a slightly touch of alcohol after 2 or 3 days of fermentation. 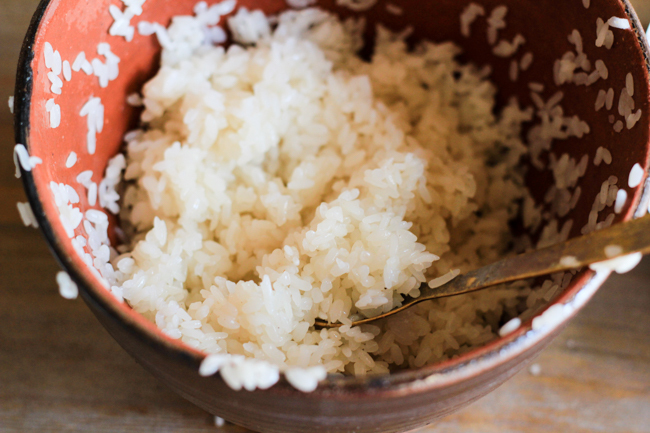 The well fermented sticky rice can be kept in fridge for around 3 weeks. But the best flavor comes in the first week. If you want to ship it to friends, place in clean jar and then steam until around 80 degree C. The fermentation will be stopped completely. Traditional Chinese fermented sticky rice--Jiu Niang. 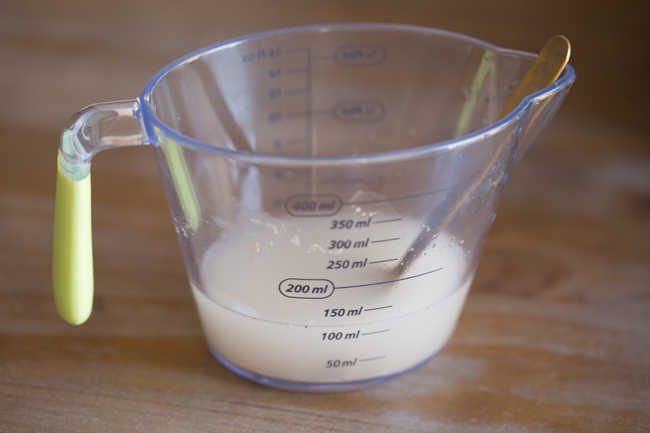 Ground the starter (save a very small pinch for sprinkling) and then dissolve in 120ml cold water. 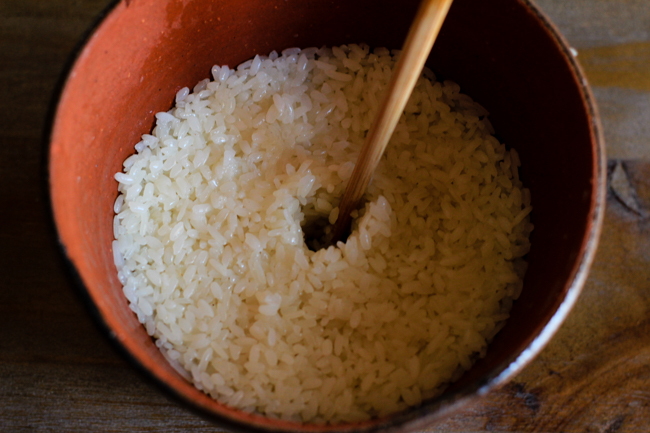 When the sticky rice is cooled down completely, wash your hand to separate the grains. 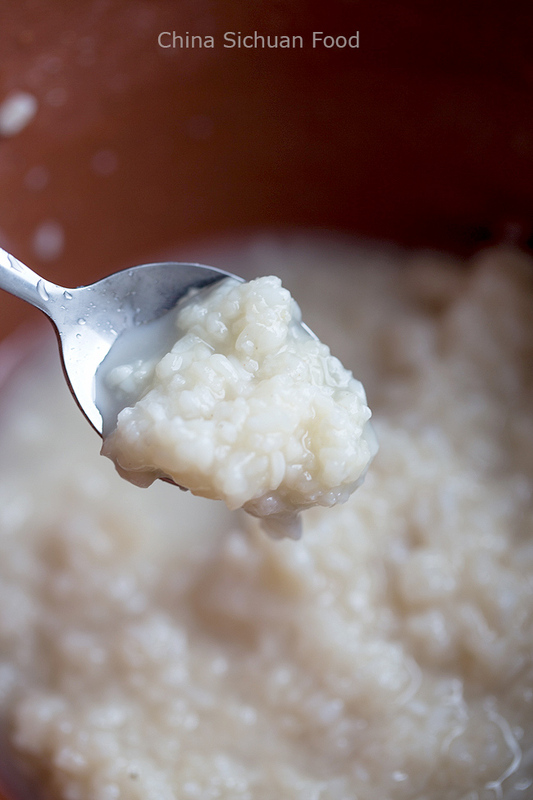 To achieve this, you need to coat your hand with cold water and slightly press the grains. I mix the yeast ball liquid firstly and then use around another 250ml cooled boiled water. Then mix the yeast liquid in. Transfer the sticky ice in container and then dig a hole in center so we can observe the process clearly. Cover your container (Firstly with a layer of silver paper and then a wood cover) and then set aside in warm place. Wait for 2 days until the center hole is filled with rice wine. Transfer to fridge to slow down the fermentation. 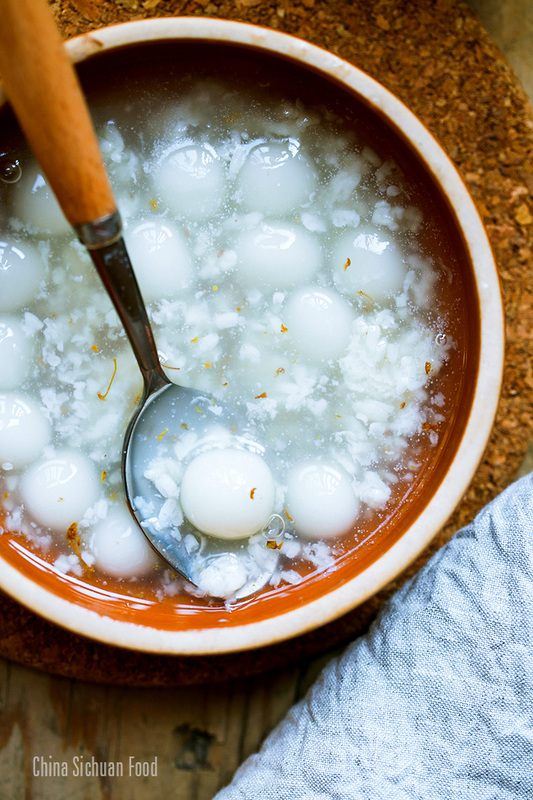 Another very popular serving way is to make a Jiuniang Tang Yuan. It will add very unique flavor to the Tang Yuan soup. I really do like your sharing experiences with fermentation. It’s a very interesting subject. I practise it a lot myself, but mainly trusting my grandmothers advice. She told me how it has to look, smell and taste in order to be right.Thus I mainly ferment vegetables – gherkins, cabbage, beets carrots a.s.o. 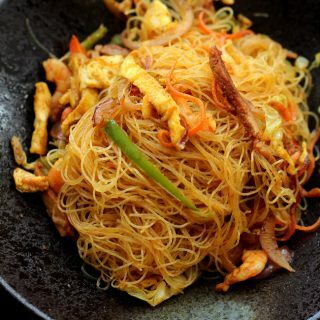 Jiu niang looks interesting and I would give it a try. I found the Shanghai yeast culture at amazon.co.uk at an outrageous price. Possibly a sherry wine yeast would do the job as well. 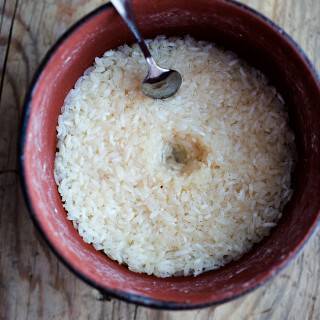 When the rice has fermented for a week, you eat it as dessert? Just using wine yeast does not work. The.molds in the yeast ball breaks down the starches into sugars for the yeast to feed on. That’s right Susanne. I am busy with my mooncakes recently. Sorry for the late reply. There are Rhizopus, mucor and a small amount of yeast in the molds. The previous two can help to break down the starches into sugar (as Brian pointed out) and then yeast turns sugar to alcohol. Because of the small amount of the yeast, the fermented sticky rice have a sweet flavor with only a slight tough of alcohol. That’s why it can be served as a sweet dessert directly. 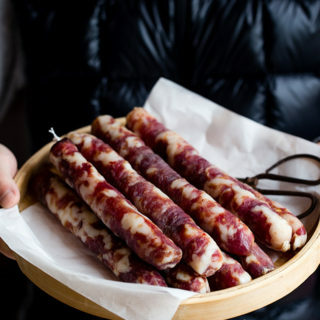 Will jiu niang be success with long grain sticky rice? Sure. I tested both of long grain and short grain rice for the small batch. They all succeeded. Thanks for your suggestion. Kati, already updated. you dont mention adding the yeast liquid at any point. you add water to it then you seperate the grains but when do you add the liquid yest? The yeast liquid should be mixed with the grains after cooled down. Hello, just firstly wanted to thank you so much for all the awesome recipes, they really are like a taste of home. I was wanting to prepare our own Doubanjiang and am quite excited. Just wanted to ask wether it needs to be made in Summer or if it can also be made in winter. It gets to minus degrees where we live but i was wondering if we could just pup the rice and the doubanjiang on the heater. Also a bit confused about the water, do i just rinse and separate the rice with my hand and then put it into a jar with the yeast, or must all the water go in there too? Also not sure when you say to leave the rice to ferment, to put silver wrap over and then a wooden lid…would it be okay to just put a wooden chopping board on top or must it be a fitted wooden lid? Thanks again for all your wonderful hard work and great tips! To stop the fermentation, should the container with the jiu niang be closed or not closed? We always keep the Jiu Niang in closed container. You need to steam it to stop the fermentation.